Sigma Nu Tau is an entrepreneurship honor society with the mission to promote, recognize, and reward academic excellence in entrepreneurship and to encourage and recognize the practice of principled entrepreneurship. Undergraduate students are eligible to join in they are juniors or seniors and have a GPA of 3.2/4.0. Graduate students are eligible to join if they have completed 50% of their program and have a GPA of 3.5/4.0. Students must exhibit honor, integrity, and a strong entrepreneurial spirit along with the above qualifications to be considered. A one-time initiation/membership fee of $50 is required to join Sigma Nu Tau. Life-long membership - membership in Sigma Nu Tau means lifetime recognition for outstanding performance in an extremely challenging field. Also available to purchase are special Sigma Nu Tau graduation honor cords! Stay connected and up-to-date on our society events! Complementary 1-Year Subscription to Entrepreneur Magazine! 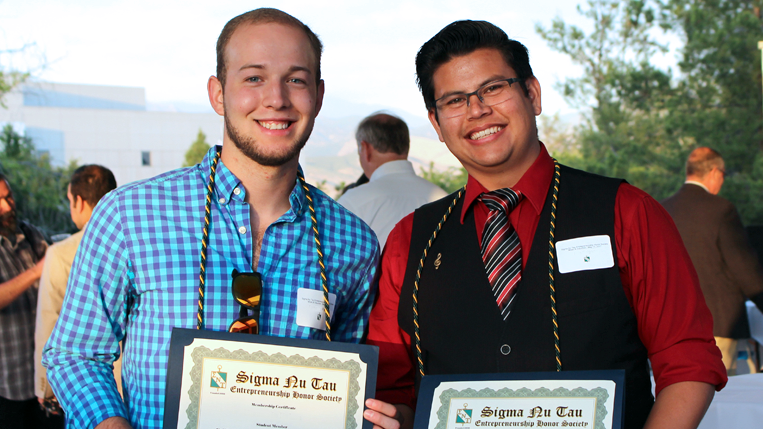 Sigma Nu Tau Membership Application - PDF format (PDF Format). Opening this file requires Adobe Reader. For more information, contact Mike Stull at mstull@csusb.edu or Susie Pryor at susie.pryor@csusb.edu or 909-537-7268.